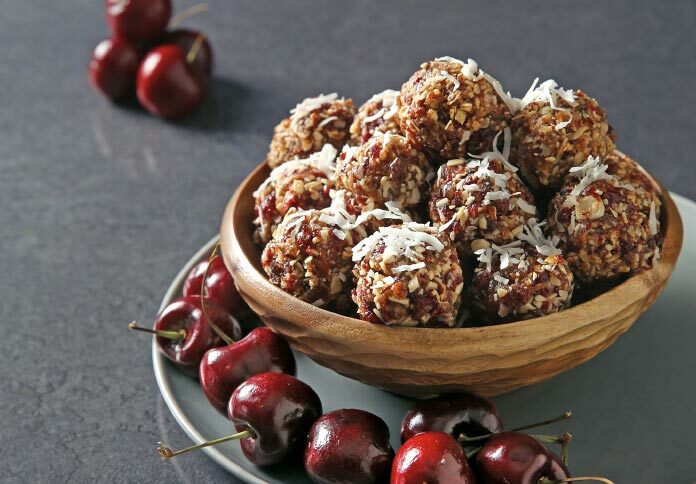 Instead of reaching for candy or chips when you want a quick snack on-the-trot, whizz up a batch of these wholefood-packed balls that will supply a dose of energy, protein and natural sweetness to keep you going between meals. Pulse the dates in a food processor until you have a smooth paste. Add in all the remaining ingredients and pulse again until well combined. Take a tablespoon of the mixture and roll into a ball. Repeat until the mixture has finished and you have around 16 balls. Place into the fridge for around 1 hour to firm up before serving. Store in an airtight container in the fridge for up to a week. Add ¾ cup of shredded coconut and all the remaining ingredients (strawberries, oats, almonds, dates, almond butter) to the food processor. Process on high speed until smooth and completely incorporated. Scoop out 1 tablespoon of the mixture and roll it into a ball. Roll the ball into the shredded coconut. Place on a baking sheet lined with parchment paper. Repeat with the remaining strawberry mixture. Place the baking sheet in the refrigerator for 2 hours minimum before serving. Keep in an airtight container in the refrigerator. Mix it up: Try different nuts and nut butters if peanuts aren’t your thing; almond or cashew also work very well.